Find hotel near Yacimiento De La Sierra D ..
Yacimentos de la Sierra de Atapuerca is a mountainous region at Castile and Leon in Spain. It is not only an area of natural interest but also a cultural heritage. A large number of archaeological things were found at this spot very recently. The caves of the Sierra de Atapuerca are home to fossil records of the earliest humans being in Europe which dates back to as far as one million years ago. The reserve is an exceptional scientific study of our human ancestors. Owing to which, these mountain ranges have been in limelight since a last few years. A nearby museum exhibits the findings of the place which makes it easier to understand the importance of the mountain range. The railroad trenches: These trenches are remains of the railway line constructed during the industrial revolution for mining purposes. The archaeological diggings: These are found here owing to ongoing excavations. Mirador: Remnants of the Neolithic and the Bronze Age have been found at this spot. Orchid Valley: This site is outside the caves and has an amazing length of 30,000 years. The place is popularly known as Sierra de Atapuerca. Ensure that you visit the Museum of Human Evolution along with the mountain range. How popular is Yacimiento De La Sierra De Atapuerca? People normally club together Cartuja De Miraflores and Museo Del Libro Fadrique De Basilea while planning their visit to Yacimiento De La Sierra De Atapuerca. 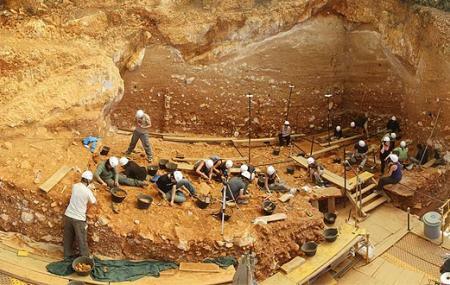 People also prefer to end their day with Yacimiento De La Sierra De Atapuerca.